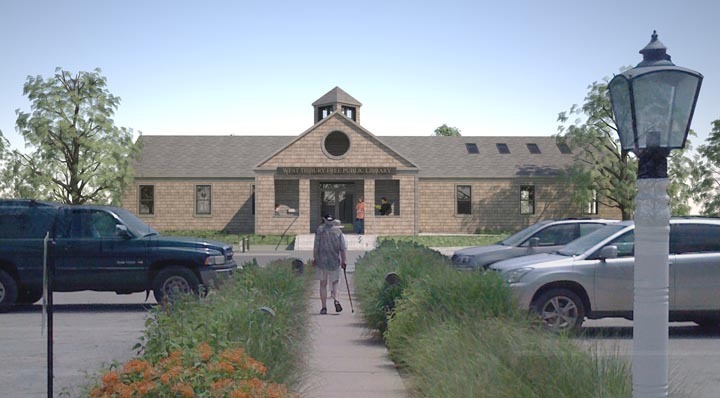 Artist’s rendering of planned West Tisbury library. The West Tisbury public library has long been the darling of the Vineyard library system, treasured by its patrons for its charm, versatility and convenience. But with the highest circulation on the Island and one of the highest in the state, the small library has outgrown its stacks. On April 10 town meeting voters will be asked to approve building a new facility at a cost of $1.5 million to the town. The new library is estimated to cost a little over $6 million total, with the bill shared among three sources. Nearly half of the bill, or $2.98 million, will come from state grant money from the Massachusetts Board of Library Commissioners. Another $1.57 million has been raised through private donations to the West Tisbury Library Foundation, Inc. and the Friends of the West Tisbury Library, Inc., both nonprofit organizations. The remainder, $1.5 million, will be paid for by town borrowing, provided two-thirds of voters approve taking such action at the annual town meeting next month. A corresponding ballot question at this year’s town election, on April 12, will ask voters to exempt the borrowing from Proposition 2 1/2, the state tax cap. Both the ballot question and town meeting article must pass in order for the town to receive the state grant funding. Planning for the library began in 2007 when the West Tisbury space needs committee recommended that the library double in size to meet increased demands. Two years later designs reached completion, and in June 2011 the West Tisbury library was one of eight towns selected to receive grant money to rebuild or renovate libraries. There were nearly 30 applicants, 15 of which are wait-listed — including Edgartown. Funding for the town libraries comes from a $60 million fund designated by Gov. Deval Patrick in 2008; $27.4 million was awarded in the first round in total. Massachusetts Board of Library Commissioners spokesperson Celeste Bruno said this week the West Tisbury library project scored well in design and in meeting the needs of the community. Library trustees and officials have made an ongoing attempt to include the public in the planning process, staging regular public forums and soliciting comments on the design during the past two years. On Monday, March 26, voters will have one last chance to comment on the design at a public forum at the Howes House in West Tisbury at 5:30 p.m. Members of the library building committee, library board of trustees and architects will be on hand to answer questions. That group will also attend the annual town meeting. The new library plans call for doubling the size of the current building, from 5,640 square feet to 13,000 square feet. The H-shape design is by Boston based firm Oudens Ello Architecture, with lead architects Matthew Oudens and Conrad Ello, the same firm designing the new Martha’s Vineyard Museum. In keeping with the town’s agrarian heritage, the new structure pulls ideas from neighboring barns while working toward a Leadership in Energy and Environmental Design (LEED) certified design. If approved, the library would be the first town building with the certificate and qualify the town for a $100,000 state energy grant. A study room for young adults, a programing room, director’s office, staff work space, adult reading terrace, meeting room, children’s reading room, porch and garden, and more restrooms are some of the amenities incorporated into the new design. The new program room will be available to the community after-hours for meetings, workshops and performances; there’s even been discussion of trying an after-hours self-checkout system, as well. Mr. Waters said support of the West Tisbury library project has been overwhelmingly positive, pointing to successful fund-raising events and a high level of community involvement in the planning stages. “We want people to be familiar with these designs so they’re not voting for a pig in a poke, we want to give them every opportunity . . . so people really feel there isn’t anything they haven’t had a chance to comment on,” he said. If approved at town meeting, construction on the library is expected to begin in the fall, with a grand opening in late 2013. During that time the library’s existing reading room will be moved across the street to town hall property, where it will serve as a temporary library space. Mr. Waters said during construction the library will become a borrowing library rather than a browsing library — space will be limited and much of the library’s holdings will be kept in storage at a library set up at the Martha’s Vineyard Hospital, and through an adopt a book program. Organizations and individuals will be asked to volunteer to hold on to a collection during the interim. “It’s going to be an awkward period for everyone and we hope everyone will be patient because the payoff is going to be huge,” Mr. Waters said. The library has joined the Cape Libraries Automated Materials Sharing (CLAMS) network this year, and with Chilmark and Aquinnah libraries making the same investment, all Island libraries will be linked to the borrowing system that serves the Cape and the Islands. Being a part of the CLAMS network will allow the library to provide the same content without requiring the same amount of wall space. West Tisbury library director Beth Kramer said she hopes the increased volunteerism brought on by the project will be sustained in the new building. While the design will change and space will double, Ms. Kramer said the character of the library will largely remain the same — with a few notable changes. “The library is going to be able to deliver forms of information and relaxation and cultural options we can’t do right now,” she said. It will also say goodbye to the Dewey Decimal system. The new library will abandon the traditional classification system and opt for more of a bookstore feel, Ms. Kramer said. Each group will have their own space, something that has been greatly needed for some time, Ms. Kramer said. When students come to the library after school, they frequently end up doing work on the floor because there are no seating areas. Families are helping to design the interior of the children’s rooms and teens are helping to design the young adult room.